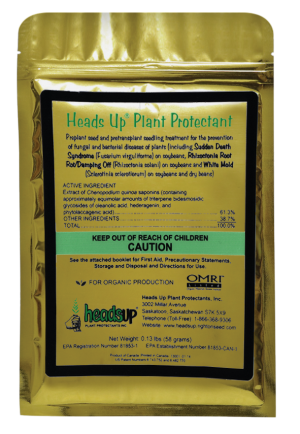 Heads Up® is a patented proprietary composition based on naturally occurring plant extracted biochemicals. Unique biochemicals that have been selected, concentrated and enhanced to produce the unique desired effect of eliciting specific systemic plant defense pathways. Studies have shown Heads Up® while not being active on the disease itself uses a different mode of action (M.O.A.) known as Systemic Acquired Resistance (S.A.R). When Heads Up® is applied as a seed treatment it enables the germinating seed to inhibit the attacking disease through it’s own defence mechanisms. This M.O.A. offers systemic, full season protection against yield robbing pathogens. Heads Up® is a natural source plant defence activator, and is EPA registered as a reduced risk bio-fungicide. Heads Up® is available and sold as a 58 gram (0.13 lb) concentrated water soluble, dry powder that does not contain any living micro-organisms. Because Heads Up® contains no living micro-organisms, it is a stable product with a long shelf life. To learn more about diseases controlled and how to use Heads Up® click here.